The Laponian Area is a vast Arctic landscape in North Sweden, inhabited during the summer by some 200-250 indigenous Saami people. They fish in the area and practice reindeer husbandry. The Saami arrived here some 4000-5000 years ago, and turned to herding domesticated reindeer in the 17th or 18th century. The designated zone stretches over an impressive 9400 square kilometres of wilderness. The landscape is part mountains, part taiga lowlands. Natural features include wetlands, glaciers, moraines, canyons, ravines and boulder fields. Its location in the Subarctic Birchwoods biogeographic Province distinguishes it from other taiga WHS such as Nahanni and the Virgin Komi Forests. The Laponian Area is a big WHS comprising 9 nature reserves that needs some time and research to cover. Not many general interest tourists put it on their itinerary: on the web I mostly found trip reports about multi-day hikes, for which you have to take everything with you on your back (25 kg seems to be a minimum). Paths are scarcely marked: those that are experienced enough to hike here get along fine with GPS and/or compass. From the comfort of my rental car I encountered several of these long distance hikers with their huge backpacks by the side of the road, waiting for a bus or just getting ready to start their walk. The designated area lies north of the Arctic Circle between the towns of Jokkmokk and Gällivare. I used the latter as my base for 2 nights. The town will never win any beauty contest, but if you’re not fussy I can recommend Gällivare B&B and the local Thai restaurant. I started my Laponian exploration with a day trip by car to Stora Sjöfallet National Park. From Gällivare it takes 2.5 hours (184 km) to Ritsem, which is as far as you can go into the park on a paved road. The forest landscape is beautiful against a clear sky, it often reminded me of the Jasper area in Canada. However the views here are tainted by omnipresent mega-electricity poles that run parallel to the road to Ritsem: the area has several huge hydro-electric plants. The 'Naturum' visitor center lies about half-way, and offers great (unspoiled) views of the lake and the surrounding mountains. The center itself is worth a quick visit too, though for more in-depth exhibitions on this region and its inhabitants I recommend the Ajtte museum in Jokkmokk. Original remains of the Saami lifestyle are harder to find. At the turnoff for Appojavrre, a 350m long path into the forest ends up at nine former hearths that were used to warm the Saami tents. This is what remains of a Saami settlement after they’ve moved on. Another exit, marked “G Kapellplats", leads you to Nabrreluokta Chapel. The chapel was built in 1646, but did not last long: it burned down a few years later as the Saami were more attached to their traditional beliefs and most were not christianized. Now there’s only a commemorative marker and a heap of stones that may or may not be from the original building. There’s a clear visible difference between the west side of the parks and the east side: the more west you go, the more mountaineous it gets. The east consists mostly of taiga or boreal forest. On my second day in the area I visited a park in the eastern zone: Muddus National Park. There’s access from Liggadammen (just south of Porjus), where a sign to the park sends you 11km on a bumpy road. It ends at a car park, where to my surprise I already found some 10 other cars. Two trails are marked from here: a 7km hike to the Muddu waterfall, or a 5 km hike to “Moskokorso” (whatever that may be). I choose the shorter walk. The trail turned out to be mostly flat. You walk on boardwalks for half of the time, as the ground in this forest is very squashy. I dubbed it the “taiga hike” - a wander in this kind of forest was a first for me. I enjoyed the colours of the forest, the fungi and the large male reindeer that I startled on the path. After some 45 minutes the track gets more rocky and wasn’t so nice to walk on anymore. I never made it to the end: I turned around after 1.5 hours. A rather fine walk on a bright sunny day, and fortunately the mosquitos were mostly absent. At the time of inscription IUCN proposed extension of this Laponian WHS across the border to Norway. The area still is on that country’s Tentative List but the Norwegians seem in no hurry to nominate it. From the beginning of the 20th century, the Saami in Norway, Sweden and Finland live under different conditions. They represent themselves in three different parliaments 1, and do not seem to have a strong pan-nationalist lobby. So the Laponian area may well stay a purely Swedish contribution to the WH List. I visited this WHS in June 2018. I used Gallivare as my base and stayed there for 3 nights focusing mainly on the inscribed Muddus National Park and Stora Sjofallets National Park. The Laponian Area is a mixed WHS and is inscribed for its nature and for the Saami culture. There are protected rivers, vast boreal (taiga) forests, glaciers, mountain massifs and a landscape that bears geological testimony to its formation over eons. 4 National Parks (Padjelanta, Sarek, Muddus and Stora Sjofallet) and 5 nature reserves (Stubba, Staunja, Tjuolta Valley, Sulitelma glacier and Rapa delta) are inscribed. The national parks and nature reserves are jointly managed with the Saami people which reminded me of a similar agreement in Australia at Uluru. 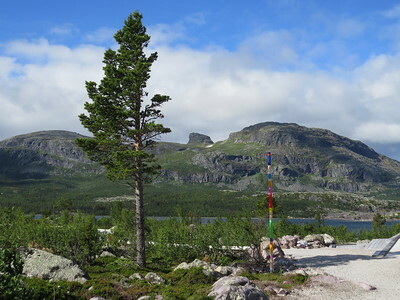 For thousands of years, the Saami people lived in these mountains and forests. The sun and the wind steer people's nomadic lives here. Reindeer provide humans with food and clothing. The few Saami remains which can be seen are a number of barely visible stones in a ring on the ground which form hearths which marked the Saami's temporary homes, settlements and reindeer foraging areas. Today Laponia is where Saami people from 9 communities live and work. They follow the reindeer herds on their seasonal foraging migrations. On a wider scale, the Swedish Laponia forms part of what is known as Lappland or Sapmi, which stretches from Norway to Russia. The best way to visit this immense area (9400 sqaure km) is either by weeks of serious hiking in summer or with a snowmobile in winter. On the other hand, I tried to get a taster of 2 national parks covering a lot of kilometres of paved and unpaved roads with a rental car, stopping at various panoramic viewpoints and admiring nature along the way and fitting in short hikes over long sunny days (making full use of the midnight sun). After driving towards Jokkmokk, just before the bridge that crosses over the dam (which leads to one of the Arctic Circle signs (Polcirkeln)), there is a road with a brown sign indicating Muddus National Park which passes beneath the bridge and leads to a two-way 11km unpaved road to the Muddusfallett 7km trail leading to a pretty waterfall and to the Moskokorso 5km trail which leads to a 100 metre deep cleft valley with water gushing to a lake. Combining both trails made a convenient 12km loop trail on board walks, rocky and soil terrain. Before getting to the waterfall, I managed to spot the rare bearded lichen among different types of moss, humus and ferns (apparently this type of lichen also grows at higher elevations in the inscribed areas of the High Coast). Woodpeckers and small birds are a common sight along this boreal forest or taiga trail. Before reaching the Moskokorso lake (Moskokorso is a proper name apparently), I avoided some elk poo along the trail and also spotted a decomposing elk carcass in the distance. Hopefully, it died of natural causes and not because of a brown bear attack, I told myself as I hurried on! Being summer, there were several flowers and a pretty deep red moss species which caught my attention. I enjoyed my hikes but there wasn't anything which was too different from any primeaval beech forest around Europe. In Jokkmokk, after visiting the two wooden churches with completely different styles, I visited the very interactive Ajtte Swedish mountain and Saami museum which was interesting to try to further understand the Saami culture, even if it is a bit too children-oriented. On another day, I drove further north to Ritsem (142km away from Gallivare), stopping along the way to admire different viewpoints within the Stora Sjofallets NP. The first brown sign with the UNESCO symbol of Laponia is 70 km away from Gallivare and a bit further on there is another one of the NP. The next sign after that, G Kapellplats, leads you to a small parking space on the left of the road, where there is a short path to the ruins of the Saami Nabrreluokta Chapel (1646) and some Saami hearths. The next sign further north, Appovagen Härder, again on the left side of the road, leads you to another short path to view more hearths, some of which are still used to today as there were ashes, remains of burnt wood and reindeer or elk bones when I visited. There were also 9 hearths in a row which served as a source of heat and light in Saami laavu tents. A laavu was about 5 metres in diameter. At both these stops there are small information boards in English but it is very hard to appreciate the cultural aspect of this WHS unless you actually happen to meet some of them perhaps during reindeer migration. When I visited the North Cape in Norway a few years ago, I was lucky to meet some of the Saami communities following their reindeer herds during migration. Next stop was the Naturum Visitor Centre, with their friendly staff who are ready to welcome you with a cup of tea or coffee (if you happen to visit on a quiet day) and give you a good overview about the Stora Sjofallet national park and the Laponian Area in general. Outside the visitor centre, there's a worthwhile boardwalk loop with gorgeous views of what's left of the Great Waterfall which gives this NP its name, the Lanas lake and the snow-capped Gierkav and Juobmatjahkka mountain massifs. Here you'll definitely be able to see a lot of crowberries and red-breasted mergansers and I was overjoyed to spot a pair of golden eagles with my binoculars and a white-tailed eagle catching its prey just a few metres away from the boardwalk. Even though I visited on a sunny summer day, the arctic breeze was freezing cold so make sure to bring a windjacket. Stora Sjofallet was designated as a national park in 1909, one of the first in Europe. There are mountains, glaciers, green slopes of mountain birch and virgin pine forest. 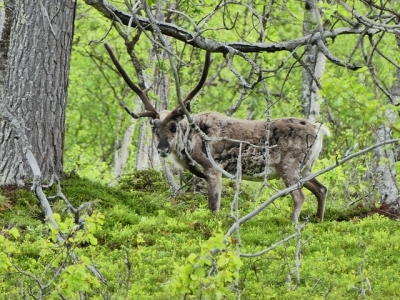 The NP is reindeer foraging land for the Saami communities of Sirges and Urina Tjerusj. The boulder-strewn terrain with relatively little snowfall is also home to many predators. The Great Waterfall which gives this NP its name, was almost completely lost due to a dam construction for the Vietas hydroelectric power plant even though this land was designated as a NP! In fact without the Saami cultural landscape component, I doubt that this WHS, which is nonetheless beautiful, would have been inscribed with all the electricity pylons, hydroelectric plants and logging going on. While driving from the visitor centre towards Ritsem and back, I stopped several times to take pictures of reindeer crossing the road or grazing on the side of the road and tracked them from a distance while hiking up some unknown trails. Overall, I enjoyed my visit of the Laponian Area but if I ever revisit I'll try to invest more time to hiking at higher altitudes with the Sarek NP to try to spot brown bears and/or moose. Along the road between Jokkmokk and Gallivare there are private 'nature reserves with brown bears' as well as a 'moose farm' if you're desperate to see them. Most probably these places are only open during the summer months. From the moment we hit the road north of Skelleftea airport we felt a long way from London. The endless pine forests, lakes and sight of reindeer galloping next to the car certainly provided that disconnect from our day to day life that you hope for on a short break. As two pretty dedicated urbanites we were out of our comfort zone and trying to get something from one of Europe's largest wildernesses in a short amount of time provided a different set of challenges for us, but I must admit I rather enjoyed my first Arctic world heritage site. Within the world heritage site proper we visited the southern part of Muddus National Park, which marks the eastern extent of the Laponian area. We had a short hike to visit the small waterfall near Skaite, which gave us a brief glimpse of the natural aspects of the site and provided me with an extensive array of insect bites for my troubles. It was enjoyable and only took a short while to get a bit of a taste of our environs. The drive through the inscribed area also enabled us to get some nice views of the wilderness extending beyond the man-made lakes that litter the area. We also visited the Ajtte museum in Jokkmokk which attempts to explain the virtues of the area. It was a good place to get a grip on both the natural and cultural aspects of the Sami heartland, though a few of the exhibits felt a bit dated. It was here that I learnt a fair bit about Sami culture, including that traditional Sami dress can tell you an awful lot about the wearer, such as where they live and their marital status. Additionally we also visited the forest Sami church town (Lappstaden) in Arvidsjaur which was rather interesting and complimented our later visit to Gammelstad. It also made me think I was on the wrong track as I was looking for built structures to help me understand a culture mostly based on migration, still it was a very interesting diversion in a small town that won me over somewhat. If you really want to get the best out of this site you will probably have to invest a fair bit of time heading to the north Western parts with their more spectacular mountain scenery and long hiking trails. There are also a fair few expensive tours that will enable you to visit and get to know the Sami population a little better, which I think would be very interesting. Sadly we weren't able to do either of these things however a few short walks, extensive driving and a midnight swim in the twilight certainly made it an enjoyable first excursion north of the Arctic circle. My day trip to Ritsem passing through parts of the Muddus and Stora Sjofallet National Parks started from the picturesque old railway station in Gallivare. From outside the station I took a #93 bus and spent the day travelling to and from Ritsem, stopping off at several spots along the way, and taking a hike up to get a view of Mount Akka across the lake from Ritsem. The cultural aspect of this site is a bit hard to find, and visually it doesn't compare with the more dramatic mountain scenery of the South Island of New Zealand. 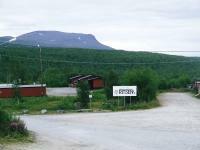 I visited the Laponian area in June 2009. The weather was good, sunny and warn, to the point of being able to bathe in the lakes. 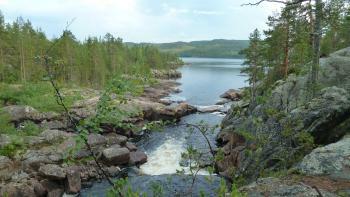 The Laponian area consists of 7 national or nature parks. The most intesrestings are (un)fortunately only accessible by several days trekking. Even in excellent waether condition, it is only advised for experienced trekkers, due to its remote locations, and arctic climate. Sarek National Park, which seems to be the most interesting area is therefore of reach for independant traveller. I rented a car in Kiruna (easy and relatively cheap air acces from Stockholm) which allowed me to travael trough four of the parks. Going from the east to the west, the landscape gradually changes from lowland to mountanious. From the Malmberget to Jokkmokk main road, I took a small dirt road to the east, going to the Muddus National Park. The park preserves un undisturbed primeval forest and several deep ravine with a few waterfalls. The road stops at the park entrance, but they is several hikes (easy to walk, clerlay indicated) that follow a canyon to a waterfall. Then I backtracked to the main road, and then took the 142 km long road west to Ritsem. The road pases the Stubba and Sjaujna nature reserves consisting mostly of lowlands. It follows the Stora Lulevatten Lake (an artificial lake actually not part of the WH site) with nice view on the moutains to the West. They are no easy hikes there. I then reached Stora Sjöfallets National Park. The landscape then turns mountainous. They are steap valleys and strong rivers and waterfalls to be seen. From the road you can guess far away the Sarek mountains with high peaks and glaciers. This area is cut by artificial lakes, the biggest being Akkajaure. They unfortunately alters the natural landscape (most were half-empty with no vegetation on they sides). The lakes are considered outside the site borders. In that area, you can wanders along lakes, climb boulders ofr briefly hiked along the Kingsleden. You would need a few weeks to hike the Kingsleden from start to end. The Laponian area is a mixed site because of Saami cultural environment. Along the way, they are several Saami villages and a few reindeers farms, but in June, the reindeers are gazing way up in the mountains. They is a few old Saami churches and cult places, but they are difficult to find. Along the road, they is several places to sleep, hotels or mountains cabins. I would definitely recommand a trip to those national parks. From Kiruna, you can also drive a few hours to the Lofoten Island in Norway (on the TL). At inscription, its name was changed from "The Lapponian Area" to "The Laponian Area"
The easiest access is from road E45 between Gällivare and Jokkmokk: on the east side of the road lies Muddus National Park, on the west side is the turn-off for Ritsem which will take you through Stora Sjöfallet National Park. There are also buses in summer: line 93 from Gällivare gets you in Ritsem 3 times a day. Glaciers: Sarek NP contains over 200 glaciers, Stora Sjöfallet NP's "most prominent sights are the peaks and glaciers of the Akka range". Built in the 4th millennium BC: "The area ...was first occupied in the Palaeolithic period, towards the end of the last Ice Age, about 10,000 years BP. The settlers were nomadic hunter-gatherers, subsisting principally on wild reindeer.... remains of human settlement over wide areas of the site indicating a hunting and fishing culture from between 3500 and 2000 BC evolving around 2000 BC into use of trapping pit systems. Extensive reindeer domestication and nomadic life based on herding of tame reindeer did not develop until the17th and 18th Centuries" (IUCN) "This area has been occupied continuously by the Saami people since prehistoric times (having) .. arrived from the east 4000-5000 years ago ...(They) began hunting wild reindeer, like their predecessors, but slowly replaced them by domestlcated herds, wlth which they migrated during the year. They practised a form of transhumance, spending the summer in the mountains and the winters in the coniferous forests to the east. (ICOMOS) " Timeline based on arrival of Sami. Name changes: At inscription, its name was changed from "The Lapponian Area" to "The Laponian Area"